Create Wealth Through Long-Term Investing and Short-Term Trading: Do We Plan For Our Own Retirement Based On Other People To Provide You The Number? Do We Plan For Our Own Retirement Based On Other People To Provide You The Number? Every household is different and relative! How much is enough is definitely relative? Read your Past and forecast your Forecast. So far; Uncle8888 still prefer this model after searching through the cyber world and NLB bookshelves on adequacy for retirement planning. Read? Is Your Nest Egg Holding Up? A more sophisticated way to measure the success of a retirement portfolio is the one used by large pension plans. You compare what's called the actuarial present value of your assets and liabilities. 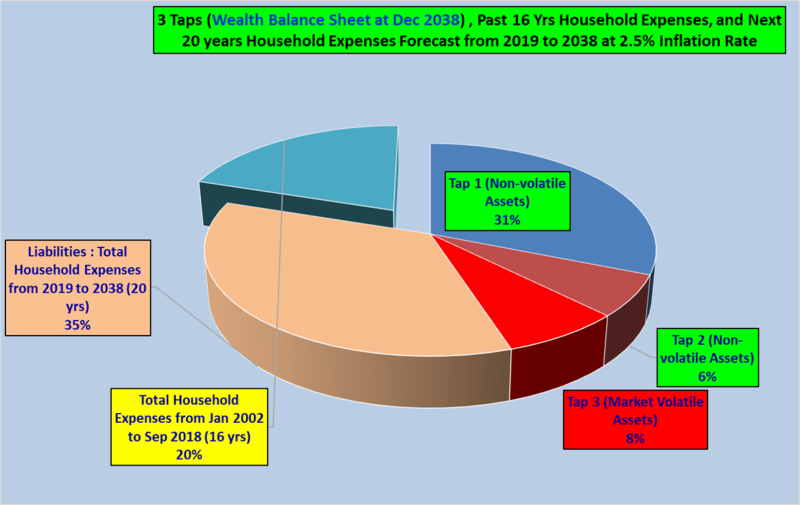 The twist: Instead of looking at current assets and liabilities, you look at the value of all your expenses in retirement as a lump sum as compared with the value of all your assets as a lump sum. How to poke you in futute? Then out it comes: "A more sophisticated way..."
Errr .... "Read your Past and forecast your Forecast"
How to be grey when need to measure your past to 2 decimal places? Kekekeke!! Some are numbers people, others are broad brushstrokes people. The "more sophisticated way" can be very grey as it involves plenty of predictions & assumptions. That's why many pension plans are running into problems. A 0.5% difference in long-term projected returns, inflation rate, life expectancy, expenses rate, contribution rate etc can (and did) result in unexpected outcomes. It's more sophisticated coz the "pros" will tell you yes can meet your projected retirement needs at 90% probability and at 98% confidence level. LOL! I just poked; you twist and twise the bayonet!!! Next time when its my turn, please give chance! Just tickle me can oredi? Please? I buy you coffee? Hey! That's no different than wetting my index finger into my mouth and holding it up in the air!? The PAST is easy to backtest and benchmark - it already happened. Duh! 1) You never expected it, but what if xiao mei mei starts flirting with you? Mistresses cost money OK? 2) You think you finished supporting your grown-up children... Wait they come and tell you they want to go for their Masters!!! Sugar daddy scholarship can? I am old, weak and and poor so I should be quite safe from predator xmm. Old and weak are your strong attaction points! If I'm a gold digger, the last thing I want is someone young and strong with lots of years ahead of him! Actually De-accumulation phase is the hardest time for investing if your accumulated capital & assets still are not large enough to generate cash for your daily/yearly expenses. Then tighten your belt if U must until more conducive time in the market. To Escape Or To Achieve??? Value Meal - Single plate but cheaper! Earn More, Save More And Invest Well??? Do You Need 2.7% T2023-S$ Temasek Bonds After 55? WHY PEOPLE LOSE MONEY IN THE STOCK MARKET??? All Schools Are Good School??? A three-way test for your portfolio?? ?